The spotted Cucumber Beetle is a common beetle found in the home garden. It has a black head and antennae with a yellow-green colored body. It has twelve dark spots on the top and three pairs of short legs. One common name is the southern corn rootworm because in the larvae stage it feeds on the roots of plants. Spotted Cucumber Beetles migrate from the south to Illinois. 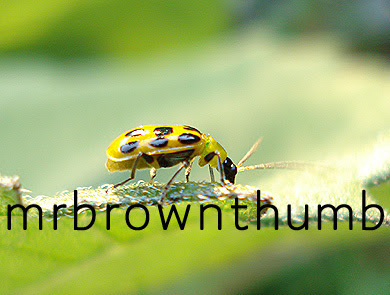 They attack edible plants as well as ornamental flowers and cause seedling damage and later attack full grown plants. It is believed that as these beetles feed or crops and ornamentals that they spread bacterial wilt and mosaic, two serious plant diseases. There is also a related Stripped Cucumber Beetle but I've not seen it in my garden or around Chicago. The stripped beetle can overwinter in the ground unlike the spotted one that migrates here and can produce several generations in one growing season. I've noticed that this beetle is aware of it's surroundings and will drop to the ground and hide in the soil or among the plants when I come across it. While it is a nice looking beetle I try to catch them and kill them when I can sneak up on one resting on the foliage like the one pictured here. Outstanding bug photos. I like this one a lot. How do you manage to get such clear macro photos? Usually the DOF (depth of field) is lousy and parts of the bug are blurred but yours seems to be all in focus. Does your camera have multiple focus options? The one I'm using has spot, center and multi. I find that using the multi option when getting really close helps bring bugs in focus because they have multiple points as you mentioned. Hmm, my camera does have multiple focus. I think it has 9 separate focus boxes but I think I'm using the spot focus. I'll try the multi and see if that doesn't help or maybe stand back a little instead of trying to fill the frame. Thanks for the tip. I don't think I could kill that beetle, it looks like something from a child's picture book. I hate that spider in the post above though, I'd smash it in a second. lostroses, don't let their cute appearance fool you. They're bad news...I think I'm loosing a E. White Swan to them this year.